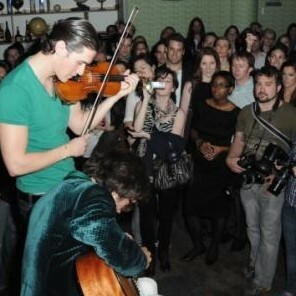 Music Unites hosted an intimate performance featuring classical violinist Charlie Siem in the Fred Perry Room at Spin NYC as part of our classical music initiative. He played solo and was also joined by an acoustic guitarist. DJ Jamie Biden spun before and after. Guests enjoyed the music and drinks from St. Germaine and Barterhouse. A lucky attendee who entered our raffle won a tee shirt and tickets to our next events. All proceeds benefit that Music Unites Youth Choir and help bring education into underfunded inner city schools.